The new Far Cry 4 story trailer is long, stylish, and wrapped in a dreamy, very James-Bond-theme-song-style take on a classic rock track. It's also got a guy getting launched from the top of a tower by way of a double-barrelled shotgun blast to the back and a dangerously addled Hurk jumping a quad off the side of a cliff, thereby maintaining the magnificent dichotomy we know and love as Far Cry. I don't think there's a whole lot in the way of big revelations to be found in this new video. 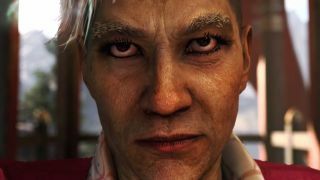 You are Ajay Ghale, you travel to Kyrat to fulfil your mother's last wish, Pagan Min picks you up at the airport, and then everything goes a little sideways. It looks to me to be pretty much the same as the past couple of Far Cry games, albeit much prettier, but I do dig the game-to-game evolution and refinement of the franchise's central villains. They're not necessarily the kind of guys I'd want to go out drinking with, but they sure are interesting. Far Cry 4 comes out on November 18.